Audio Architect is the software element of HARMAN’s Architectural Media Systems, and is a single control platform for all devices in a HiQnet sound system, from microphone to speaker. HARMAN Architectural Media Systems combines the processing power of BSS Audio and Crown Audio’s category leading amplifier technology with the configuration and control capabilities of HiQnet Audio Architect. This solution provides audio professionals with the most complete, versatile platform available for small to large-scale AV system design, with the single point accountability of one-stop comprehensive support and logistics. 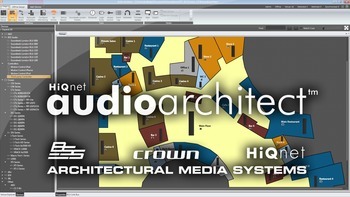 Architectural Media Systems provides networked audio connectivity via the designer’s choice of AVB, HARMAN’s proprietary BLU Link bus, Cirrus CobraNet or Audinate Dante. “The release of Audio Architect 1.1 reflects HARMAN Professional’s continued commitment to offering universal networking solutions with multiple transport options – HARMAN’s own BLU link bus, Audinate Dante and CobraNet® are all configurable in Audio Architect today. In a future version, AVB support will also be added, rounding out Audio Architect’s readiness for any networking application,,” said Adam Holladay, Market Manager, HARMAN System Development and Integration Group. Version 1.1 now provides support for the Crown DCi 8|600N model of the DriveCore Install Network Series networkable amplifiers, which have BLU link connectivity and point-to-point audio networking compatibility with the Soundweb London family. Version 1.1 also supports the Crown USBX accessory that enables Crown XTi, CDi and DSi Series amplifiers with a USB port to be operated via an Apple iPad or iPhone.